Synopsis just sued Ubiquiti alleging violations of the Digital Millenium Copyright Act, but it hasn’t yet been reported. One of the largest software companies in the world, Synopsys describes itself as a leading provider of Electronic Design Automation solutions for the semiconductor industry. Beginning at a time unknown to Synopsys, Defendants have been using counterfeit keys obtained or created with tools obtained through hacker websites to circumvent the Synopsys License Key system and access and use Synopsys’ EDA software, including at least its Debussy, Design Compiler, Formality, HSPICE, IC Compiler, Laker, Nlint, nWave, PrimeTime, Synplify Pro AV, Synplify Premier AV, TetraMAX, VCS, and Verdi applications, without a valid license. The fact that Defendants were not being required to pay Synopsys a license fee for access and use of the software alone should have put Defendants on notice that their access and use of Synopsys’ software was unauthorized. Furthermore, Synopsys previously informed Ubiquiti of its unauthorized use of Synopsys’ software. Upon information and belief, Defendants Ubiquiti and Ubiquiti International have used counterfeit keys to circumvent the Synopsys License Key access-control system at least 39,000 times by 15 usernames. Upon information and belief, Defendant Tsai has used a counterfeit key to circumvent the Synopsys License Key access-control system at least 66 times. Stay tuned. Details here. View the full complaint below. 6 Attorneys for Plaintiff SYNOPSYS, INC.
ACT, 17 U.S.C. §§ 1201, ET SEQ. relief as the Court may deem proper. Synopsys alleges the following based on personal 10 knowledge, unless indicated as on information and belief. Plaintiff Synopsys is a corporation organized and existing under the laws of the 13 State of Delaware, with its principal place of business in Mountain View, California. 14 2. Defendant Ubiquiti is a corporation organized and existing under the laws of the 15 State of Delaware, with its principal place of business in San Jose, California. Plaintiff is informed and believes that Defendant Tsai is an individual employed 19 by Ubiquiti and is a resident of California. et seq. This Court has subject matter jurisdiction over this action pursuant to 28 U.S.C. §§ 1331 and 1338(a). business lies within the State of California, and because it has conducted and does conduct business within the State of California and the Northern District of California. This Court has personal jurisdiction over Ubiquiti International because, on 4 information and belief, it is a subsidiary of Ubiquiti and has conducted and does conduct business 5 within the State of California and the Northern District of California. 6 9. This Court has personal jurisdiction over Tsai because, on information and belief, 7 he conducts business within the State of California and the Northern District of California. Northern District of California, and because a substantial part of the events giving rise to the 11 dispute occurred within this district. complex designs will work flawlessly. Accordingly, chip designers require extremely robust and 18 powerful computer software to design and test those chips. Many of the world’s biggest and most 19 important chip design companies turn to Synopsys for that software. Plaintiff is informed and believes that Ubiquiti, which is based in Silicon Valley and has offices on three continents, develops networking technology. Hong Kong, is a subsidiary of Ubiquiti and participates in Ubiquiti’s activities relating to the 6 development of networking technology. 7 15. Plaintiff is informed and believes that Tsai is employed as a Project Lead at 8 Ubiquiti. Formality, HSPICE, IC Compiler, Laker, Nlint, nWave, PrimeTime, Synplify Pro AV, Synplify 11 Premier AV, TetraMAX, VCS, and Verdi applications, are works subject to copyright protection 12 under Title 17 of the United States Code. software and to access and use specific Synopsys software programs subject to control by 17 Synopsys’ License Key system. execute the licensed software. This key code controls the quantity and term of the licensed 21 software in accordance with the license terms. 22 19. Defendants have never obtained a valid license from Synopsys to access and use 23 the EDA software that is at issue herein. Pro AV, Synplify Premier AV, TetraMAX, VCS, and Verdi applications, without a valid license. software was unauthorized. Furthermore, Synopsys previously informed Ubiquiti of its 6 unauthorized use of Synopsys’ software. counterfeit key to circumvent the Synopsys License Key access-control system at least 66 times. Synopsys hereby restates and re-alleges the allegations set forth in paragraphs 1 15 through 21 above and incorporates them by reference. 16 23. Section 1201(a)(1) provides, in pertinent part, that no person shall circumvent a 17 technological measure that effectively controls access to a work protected under this title. HSPICE, IC Compiler, Laker, Nlint, nWave, PrimeTime, Synplify Pro AV, Synplify Premier AV, 20 TetraMAX, VCS, and Verdi applications, is subject to protection under the copyright laws of the 21 United States. 25 namely, the Synopsys License Key system. Rather than paying a license to Synopsys for access and use of the EDA software, Defendants used counterfeit license keys that, on information and belief, Defendants knew to be counterfeit and in violation of Synopsys’ valuable rights. License Key access-control system, and have unlawfully gained access thereby to at least its Debussy, Design Compiler, Formality, HSPICE, IC Compiler, Laker, Nlint, nWave, PrimeTime, 4 Synplify Pro AV, Synplify Premier AV, TetraMAX, VCS, and Verdi applications. 5 28. 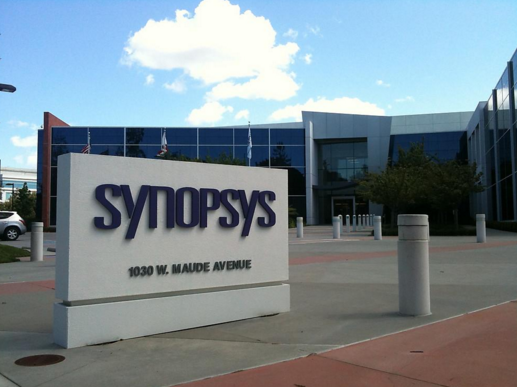 The conduct described above has cost Synopsys an amount to be computed at trial, 6 but that amount is in the millions of dollars in lost revenue, and constitutes a violation of 17 7 U.S.C. § 1201. 8 29. The conduct described above was willful and with knowledge of wrongdoing; an 9 award of statutory damages is necessary to dissuade Defendants and others from the use of 10 counterfeit license keys. 11 30. Accordingly, pursuant to 17 U.S.C. § 1203, Synopsys is entitled to and hereby 12 demands statutory damages in the maximum amount of $2,500 for each of the violations of the 13 statute. 14 31. Synopsys is further entitled to an award of attorneys’ fees and costs as provided 15 under 17 U.S.C. § 1203.
irreparable harm to Synopsys, which has no adequate remedy at law. Pursuant to 17 U.S.C. § 18 1203, Synopsys is entitled to a preliminary and permanent injunction prohibiting further 19 violations of § 1201. Synopsys hereby restates and realleges the allegations set forth in paragraphs 1 24 through 33 above and incorporates them by reference. Defendants Ubiquiti and Ubiquiti International to use a counterfeit license key to access and use Synopsys’ EDA software, and by providing their services as employees or independent contractors to assist Defendants Ubiquiti and Ubiquiti International in doing so. continuing to aid and abet Defendants Ubiquiti and Ubiquiti International in committing 9 violations of the Digital Millennium Copyright Act. remunerations that would otherwise have come to Synopsys but for Defendants Tsai’s conduct. 13 Defendant Tsai has thus caused Synopsys irreparable damages and will continue to cause 14 additional damages. All such further and additional relief, in law or equity, to which Synopsys may be 4 entitled or which the Court deems just and proper. Synopsys demands a jury trial for all issues so triable.